From the Greek physa, a bladder, an allusion to the inflated calyx (Solanaceae). 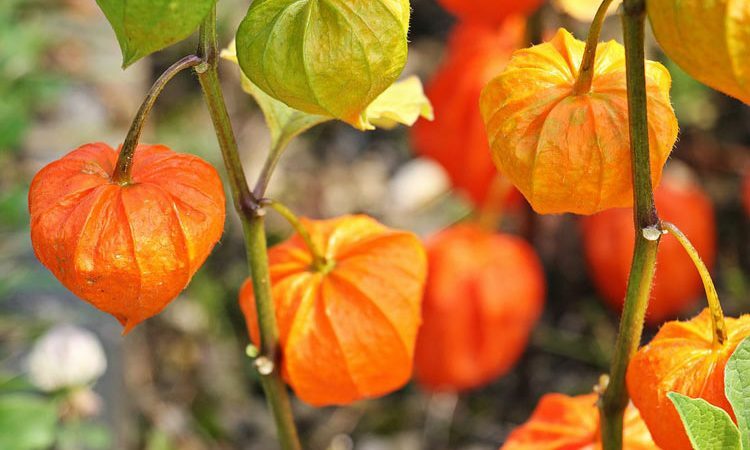 A genus of 100 or more species of which the two most well-known are P. alkekengi, the Bladder Cherry or Chinese Lantern Plant, with its brilliant, flame-coloured, air-filled calyces, and P. peruviana, the Cape Gooseberry, which is a greenhouse species. 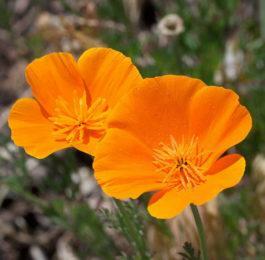 They are annual and perennial herbaceous plants, mostly from Mexico and North America. Species cultivated P. alkekengi (syns. P. alkekengi franchetii, P. bunyardii, P. franchetii), bladder cherry, bladder herb, Chinese lantern plant, winter cherry, hardy perennial, 1-2 feet, flowers whitish, similar to those of the potato, summer, fruit a single scarlet berry enclosed in the much inflated showy calyx, up to 2 inches long, turning orange in autumn, southeastern Europe to Japan, naturalized in many other parts of the world; vars. gigantea, calyces larger; pygmaea, 9 inches, dwarf form. P. ixocarpa, tomatillo, half-hardy annual, 2 feet, flowers yellow, / inch or more across, with black-brown blotches in the throat, fruit purple, sticky, almost filling the yellow, purple-veined calyx. The fruits are edible and may be stewed or used for jam making, Mexico, southern United States. P. peruviana (syns. 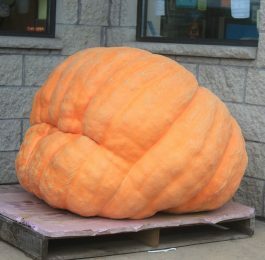 P. edulis. P. peruviana edulis), Cape gooseberry, 3 feet, flowers yellow, blotched purple, summer, fruit yellow, edible, South America, greenhouse. P, pruinosa, dwarf Cape gooseberry, strawberry-tomato, half-hardy annual, 2 feet, flowers bell-shaped yellowish, fruits yellow, edible, southern United States. Cultivation The hardy species require a rich, well-drained soil in a sunny or partially shaded position and should be planted in the spring. The fruits, popularly called ‘lanterns’ (the inflated calyces) can be used for winter decorations and can be picked and, dried in the autumn. If left out of doors, they become skeletonized. The tender species require a compost of loam, leafmould, and a little sand and should be planted singly in 5-6 inch pots placed in a sunny position. Water freely during the summer and feed regularly with a liquid fertilizer. Pot up or plant in early spring. Propagate hardy species by division every three years, and greenhouse species from seed sown in sandy soil in heat in the spring or from cuttings placed in sandy soil in heat between January and April. P. alkekengi grows very vigorously and spreads by means of underground runners. It may be used as a deciduous ground cover plant in sun or semi-shade. Where it is suited it can become something of a nuisance, difficult to eradicate unless every piece of root is removed.